I take notice of the imposing Mulberry Tree that is in the parkway of our backyard. Its sturdy frame must have graced that spot of land for the better part of 150 years. Its knotted and gnarled branches have likely provided refuge to generations of Great Horned Owls whose most recent descendents we’ve been fortunate enough to witness stalking their prey. Suddenly, it occurs to me that I have been looking at that formidable tree everyday for over a decade while sipping my morning coffee from the view out my kitchen window. Wow, how can that be? A decade has passed in the blink of an eye. Not one, but two children now have completed their first years of elementary school and my youngest son will start preschool in the fall. They are growing like weeds. As I look around I notice it is not only my children that are growing like weeds. The grass is long, the shrubs need trimming and I have not had the chance to plant annuals in the pots on the back patio. Just a few summers ago those planters would have been in before the start of summer. This summer is different. Instead of occupying myself with yard work, housework and errands, I’ve been busy enjoying watching my children grow. Days have been spent celebrating my boys’ little successes: The oldest has pitched his first inning, our “center” child has tagged his first runner out on the dash to home plate and the littlest guy dove right into his first swim lessons. S-L-O-W-L-Y I am learning that the yard work and chores will always be there, my boys, however, won’t be little forever. Funny thing happened earlier that evening. I was in a groove, finally mowing that long grass way overdue for its weekly maintenance when a parade of people marched their way across the parkway that backs up to our yard. Under the shadow of that ever-present tree, unexpected caravans made their way to the road some towing toddlers in wagons while others sported folded lawn chairs efficiently tucked under their arms. I turned off the buzzing red Toro to figure out where they were headed. With the mower now silenced, I heard the sounds of a band warming up in the park across the way. In the hub bub of the week, I had forgotten about the Sunday Concert-in-the-Park that was about to take place. What to do? I had only mowed half the yard and the day was nearing an end. Just then my Mom entered the unfinished backyard for an unplanned visit. The mower remained parked and the lawn did not get finished that night. Instead my mom and I enjoyed a cool, fizzy drink that I had discovered several years before. A light and refreshing beverage meant to be enjoyed with friends on a warm and beautiful evening. I pulled out the recipe written on a scrap of paper and given to me by a friend who loves to entertain. Clearly I could see that my mom was a little skeptical as she watched me mix up the unusual list of ingredients. Nevertheless, hopeful I pulled out two glasses and lined the rim of each with salt. In went the ice. As I poured in the bubbly, frothy concoction I remembered the massive mound of mint that had taken over the herb bed on the side of our house. I told her to wait and when I returned with my fresh harvest in hand, I garnished each drink with a sprig of mint and a wedge of lime. As she wiped away the decorative salt from her glass recalling her blood pressure and took her first sip, distant sounds from the Concert-in-the-Park entered the kitchen floating through an open window. That night the band played several tunes from the group, Chicago, but it is one refrain that oddly stuck in my mind as I drank my delicious drink: “Does anybody really know what time it is, does anybody really care about time? If so, I can’t imagine why”. That night, I took time for myself. I visited with my mom and while she enjoyed her drink, I took mine outside. 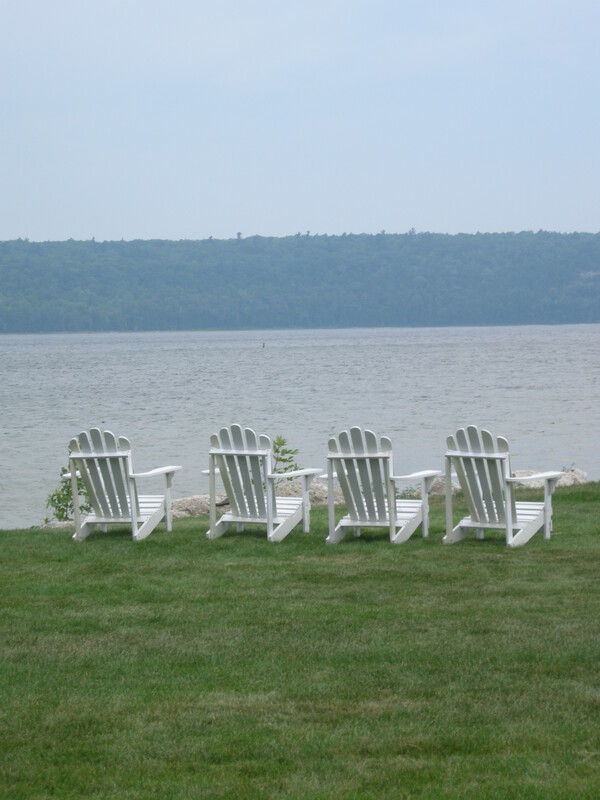 I put it on the white wooden table that sits in our backyard positioned between two matching Adirondack chairs. With the last bits of sunrays peaking through the overhead branches I photographed the drink, taking my time; waiting to capture the light when it hit the ice at just the right angle. The next day the sun rose and guess what? The yard was still there, half-mowed, not having gone anywhere but rather patiently waiting for me to pick up where I had left off. In the spirit of beautiful summer evenings where fireflies abound, this next post is not only delicious but downright delightful. 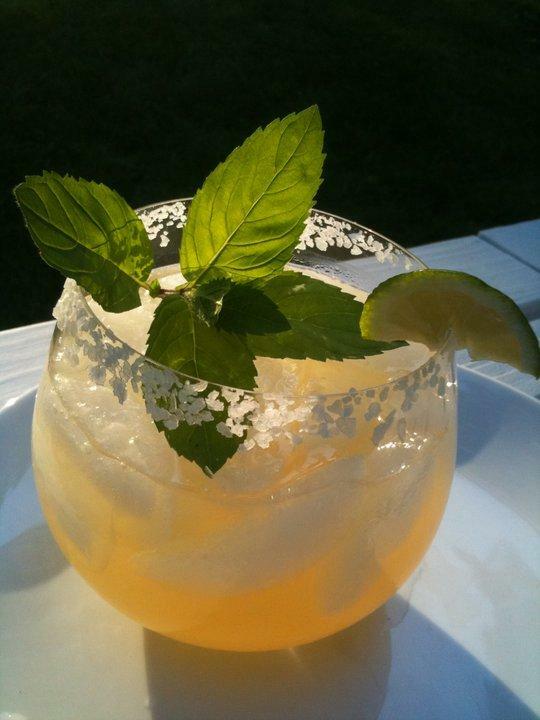 Backyard Margaritas are light, refreshing and just the ticket when relaxing with family or friends in your backyard. Whether served on the rocks in a traditional margarita glass, a tall Pilsner beer stein, or beautifully in a modern presentation using a Riedel stemless crystal wineglass, they are sure to be a hit at any party. I like using Minute Maid limeade, but think that frozen lemonade would work in a pinch. Be sure to use a light beer and do not substitute the Club Soda. I am a pink Champagne kind-of-girl so for me the bubbly is what makes this margarita distinctive. In glass pitcher pour frozen limeade. Next add can of beer. Using empty limeade can to measure add 1 can or 12-ounces of chilled club soda. Next add 1/2 a can or 6 ounces of Tequila. Stir. Run lime wedge around rim of serving glass. Dip rim into salt. Next add ice cubes to serving glass. Pour in Margarita. Garnish with lime wedge and fresh mint, if desired. Perfect Summer Evening. Ephraim, WI. August 2010. Recipe given to me by T.O. M. R.
Have I told you how much I love your writing?? I’ll tell you again. You are an author, I will see in print someday. I enjoyed the drink and break in my day. I loved the way your friends shouted out from their back yards for a glass of your Margarita. I also loved how you substituted the beer glass and ran it across the backyard to your friends house. I understand why you named your drink what you did. Now that your married and don’t live at home anymore I envy your backyard friends. You are truely a gift from God and dad and I were lucky to have you at home for all the years that we did. Dad is always telling me to call you and have you come home – alone. He misses your food and your spirit. He loves the kids but misses the little girl he used to have all to himself when the two of you cooked. Loved it-as usual! What a way to start my day. Happy 4th of July, Sue! Served these tonight to a group of friends and they were a big hit! In fact, I couldn’t pour the last serving down the drain after everyone left so I’m enjoying one tonight after my clean up. Thanks SueB! Let’s have some together soon. Looking forward to seeing what you have up your sleeve when all of the kiddos are back in school!